There’s nothing more enticing than the scent of freshly made waffles waft through the house in the morning. The problem with home-made waffles is that one needs a waffle iron to make them. And unless one REALLY loves waffles a dedicated waffle iron is not something most people are willing to purchase. Fortunately for RainyDayMagazine readers (and staff), we have found an alternative. A while back, we posted FirstLook and FirstUse reviews of a fantastic panini maker/grilling machine from Cuisinart called the Griddler. This machine has proven itself to be a true workhorse in the RainyDayKitchen. 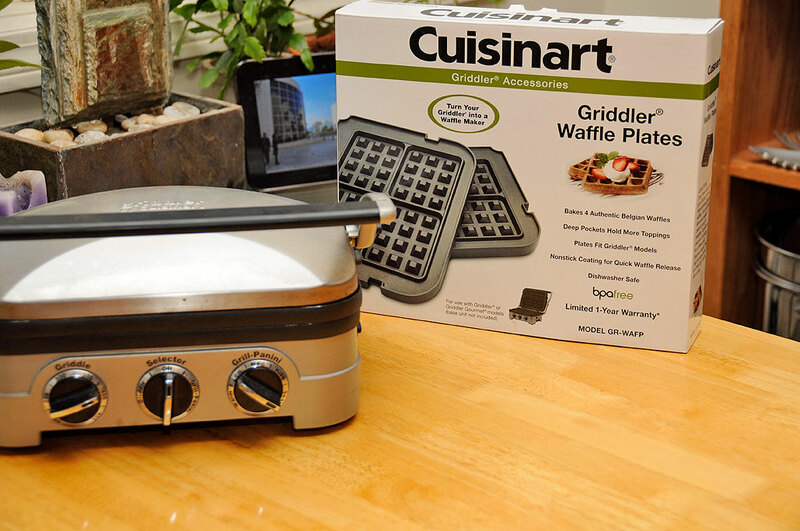 Now, Cuisinart has made the machine even more versatile by introducing a set of non-stick waffle inserts for the Griddler, enabling it to be converted from a grill into a waffle iron in seconds. The set consists of two identical plates made to fit the Griddler. The spring loaded catches on the side make switching the plates as easy as pressing a button. Another benefit of the removable plates is that clean-up is much easier. Unlike other machines, only the plates need to be brought to the sink for cleaning. The versatility of the Griddler is in part due to the design of its hinged lid. The hinge in the middle of the lid enables the top plate to remain parallel to the base as it moves. This is great for making pressed sandwiches and is crucial for the waffle iron function. No other grill can do this. With these waffle plates, owners of the Griddler can enjoy fresh home-made waffles any time they want. We will have a FirstUse write-up of the Griddler Waffle Iron in the Spring iPad issue of RainyDayKitchen. Look for it in Apple’s App Store in April.